Get rid of a double chine without surgery giving yourself the natural face lift to get a smaller face just by doing this simple face massage you can do at home. Get a face lift without surgery doing that facial massage that helps give you a small face in front of the mirror. Similar to face sliming techniques like facial exercise such as face yoga, this facial massage helps restore circulation to your face working as a great way to get rid up unsightly inflammation problems not to mention that it's free. Is it possible to get a facelift without surgery making your face look smaller? The latest trend in Japan that people are using to get a face lifts without orthopedic surgery are face massages. These facial massages is what many Japanese women aspiring for natural beauty and getting thinner face can be done at home without the need of cosmetics or other special equipment. For women worrying about how big their face appears wanting to get a small face plastic surgery is not going to solve anything. 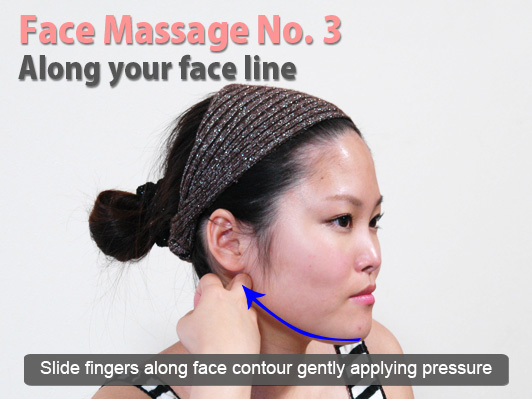 All you need to lift your face are these facial massage techniques and the rest is natural beauty with these easy to follow Simple Instructions to guide you through step by step. In this daily Slism, we will guide your through the facial massage techniques that you can use to get a small face without invasive face lift surgery including a close up on cheek lifts, how to tighten the skin around your cheeks, and a simple and easy to do face contour that you can take with you anywhere and do in the comfort of your home. 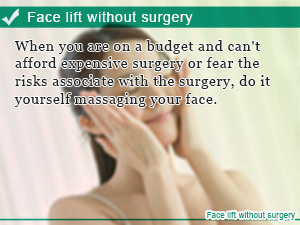 Just by massaging your face may it be possible to get a facelift without surgery. By stimulating the muscles around the contour of your face similar to the way facial posing in face yoga works, the secret to getting a thinner face may be in your fingertips. With the right facial massage technique it is said that these massages may help you get the small face sought out by many Asian woman without expensive surgery and the best part is that you can do it yourself. Note that results may vary from person to person and should be accompanied with diet and exercise. Before we get started let's take a deep breath to go over what you can expect to by doing the simple face exercise. To start out, like most facial exercises you can lift your cheeks, contour your face, and possible get rid of that double chin that's been bothering you lately. Here's how you are going to lift your cheek bones, metaphorically speaking. Just to break the ice, I will tell you it looks just like the position you would put yourself in during high school bored sitting on your desk. No wonder you have such high cheek bones. Okay now that you have braced yourself mentally, let's dive in to the face massage head first. Using your fingers push up the skins below your cheeks up using your fists and hold for 5 seconds doing 2 sets for completion. Avoid pushing against the sides of your cheeks. Always double check your massage direction before and after massaging your face. For people who have difficulty holding this position standing up, use the surface of a table to support your hands during the course of thee massage. What causes your face to look older the most is when wrinkles start to make surface around the area of you cheeks. One way you can remedy this is said to be by massaging the area around your cheeks everyday in the morning after washing your face and before applying cream flushing out potential harmful toxins. 1. Hands together joined at the palms brush the surface of your skin along your left cheek starting from the area below your eyes with the side of your right thumb proceeding towards the outer edge of your left eye closest to your eye similar to a Charlie's Angel pose and you've got it. 2. Next, bring your thumb down to the base of your neck brushing up and down massaging the area of your neck directly beneath your earlobes. 3. Repeat following the 3 patterns shown in the image below illustrating where the top of the side of your thumb should be brushed across your cheek. Note that step 2 doesn't change. Do 2 sets on each side of your face. Executing this massage technique takes precision. That's why if you are just getting started keep in mind that it all comes with practice. This is why it is dire that you always do these face massages in the mirror to better perfect your technique. After practicing what you will find is that you develop muscle memory for the massage lines on your face which improves speed and efficiency as you make progress. Another focal point on your face that may make your face appear larger than it really is if you have a double chin. Although regular diet and exercise helps, when the problem is inflammation in your face what do you do? Here is a simple massage that can help you get rid of a double chin eliminated inflammation around the contour of your face by promoting better circulation. Start off by first pinching the area of your chin together with the middle of your hand between your fingers. 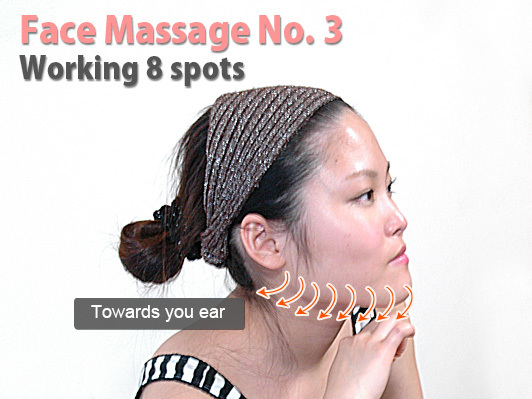 There are 3 Patterns that you need to remember to do this facial massage right for best results. With your finger placed firmly around the contour of your face surrounding your chin snap your fingers as you pull away from your chin releasing your grip. Preform this procedure on from your chin to the area closest to your ear on each side as illustrated below. This time do the same as the last pattern instead snapping your fingers upward and out away from your chin towards your ears performing in all 8 spots to completion. Apply pressure along the contour of your face working your way to the area below your ear in a sliding motion directed by your face line as illustrated below. Learn how Face Yoga can help you keep looking young without having to pay for expensive skin care treatments. Here are 4 of the best tips to get results effortless right away. Lymph drainage can be done at home!? 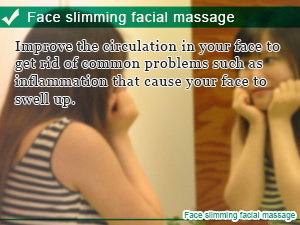 To eliminate a bloated face in the morning you are going to need this lymph drainage massage right away! If you loved face yoga you are going to love natural beauty tips like lymph and facial massages that anyone can do to slim your face whether you are at the office or home. What are the lines of aging? You may not think know it right now but doing a little bit of facial exercise ever day will pay off when your skin turns into cement. Improve the circulation in your face to get rid of common problems such as inflammation that cause your face to swell up. When you are on a budget and can't afford expensive surgery or fear the risks associate with the surgery, do it yourself massaging your face. 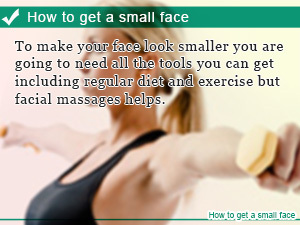 To make your face look smaller you are going to need all the tools you can get including regular diet and exercise but facial massages helps.